Motorists are being "tricked" by carmakers into buying vehicles which claim to be more fuel efficient than they really are, a new report claims. Transport & Environment said Europe's carmakers routinely abused tests on fuel performance and CO2 emissions. The lobby group found an average 40% gap between the fuel and C02 emitted in lab tests against road driving. The SMMT motoring body did not comment on the report, but welcomed Government moves to re-examine emission testing. 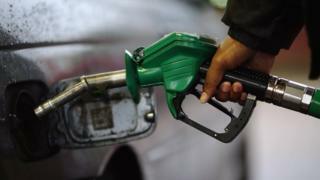 The Brussels-based Transport & Environment said drivers are spending €450 (£331) a year more than expected on fuel. Over the lifetime of a car, this adds up to an average €2,800 for additional fuel, the report found. "Carmakers are effectively cheating their own customers," the report said. Greg Archer, Transport & Environment's vehicle programme manager, told the BBC: "There is a need for a new [emissions] test but what we're also seeing here is a distortion of the current system. "The independent agencies [in Europe] that oversee the tests are paid for by the car industry themselves. In the US, we have an independent regulator, the EPA (Environmental Protection Agency) that ensures they're done rigorously." Brussels-based Transport & Environment said its findings meant that the car market was "massively distorted" with cars marketed and taxed on "a completely unfair basis". The report, which comes just days after Volkswagen admitted cheating emissions tests for its diesel cars in the US, suggests that the industry's problems extend well beyond diesel cars and a single car manufacturer. "The Volkswagen scandal was just the tip of the iceberg and what lies beneath is widespread abuse by carmakers of testing rules enabling cars to swallow more than 50% more fuel than is claimed," said Mr Archer. The lobby group is now calling on European governments to extend probes into so called "defeat devices" - which enable an engine to run below its normal power and performance in tests - to petrol cars and CO2 examinations. Fitting increasing amounts of equipment - such as air conditioning - which is switched off during the test. It said its findings meant that nearly two thirds of the gains claimed to have been made on CO2 emissions and fuel consumption since 2008 were "purely theoretical". "This widening gap casts more doubt on how carmakers trick their customers in Europe to produce much better fuel efficiency in tests than can be achieved on the road," said Mr Archer. The SMMT, the trade body for the UK motoring industry, said: "The industry accepts that the current test method for cars is out of date and is seeking agreement from the European Commission for a new emissions test that embraces new testing technologies and which is more representative of on-road conditions. "We welcome the Government's initiative to re-examine the automotive emission testing that has been undertaken in the UK. It is vital to reassure consumers that the cars operating on our roads are fully safe, legal and comply with all the latest emission requirements." Volkswagen scandal: Are car emissions tests fit for purpose? Video Volkswagen and pollution: How do you test a car's emissions?